Wild King Crab are harvested in giant pots made of steel and mesh that are dropped to the ocean floor. In Alaska, king crab seasons normally open in the fall and run through the early winter months, usually between October and January. 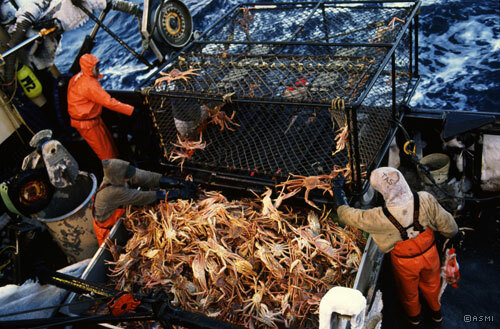 The harvest of king crab in Alaska is sustainably managed to preserve wild king crab stocks. You may have even seen the Discovery TV show Deadliest Catch which depicts the harvest of the highly-prized king crab, often in foul weather, by maverick crews in search of a huge payday. 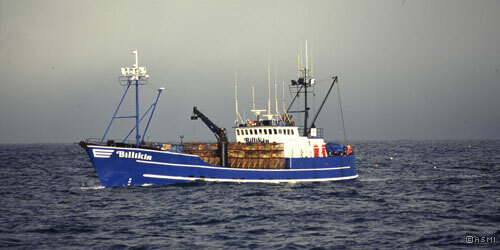 After harvesting, Alaskan king crab are kept live in huge tanks onboard the vessels then delivered to the processor. Fresh king crab are separated into clusters (half a crab without the body), cleaned, and boiled. Most are then brine or blast frozen. Later, king crab clusters are separated into individual legs and graded by size. King crab legs are graded in sizes that indicate how many legs would comprise a unit of 10 pounds. Numbers such as 9/12 mean just that, 9 to 12 legs/claws per 10 pounds. You may also see a variety of terms used to describe the size of Alaskan King crab legs such as Large, Extra Large, Jumbo, Super Jumbo. Below is a list of standard king crab sizes and corresponding common terms used to describe these sizes. Though there is no industry standard for the size terms used by various companies selling Alaskan king crab, the legs are graded by the processors after they are frozen and sawed into individual legs. Usually the smaller "feeder" claw is not considered as part of this measurement but is included in the box in proportional numbers to the king crab legs and larger "killer" claws. The last two categories are usually reserved for Golden King Crab legs/claws as the legs of most legal sized red king crab generally comprise the larger size categories shown above.When you buy king crab legs online it is very important to consider leg size. Larger sized king crab are less common and thereby more expensive. Top of the line seafood markets will ship Alaskan King crab legs intact with very few broken pieces. The price of Alaskan king crab is dictated by factors such as demand from foreign buyers (mainly Japan), the size of the allowable harvest, and to a lesser degree the health of the U.S. economy and domestic demand. In 2018 fisheries managers cut the quota for Red King Crab to 6.5 million pounds because summer survey data showed a decline in crab abundance. This quota follows two seasons where the Bristol Bay crab quota held steady at roughly 10 million pounds/yr. Because of this drop 2018 dock prices were at record highs as the season concluded in November. Again this year Japanese buyers purchased the bulk of the Alaskan king crab harvest, leaving just a small amount of Alaskan-caught crab available for sale in domestic markets. This year Japanese demand for Alaskan red king crab was again supported by their refusal to buy Russian crab - where quota cheating is rampant and sustainable fisheries practices are rarely followed. Illegal Russian King Crab Fishing In the past few years this has led to a price discrepancy between Alaskan and Russian harvested crab. In 2018 Chinese buyers stepped in to purchase a substantial portion of the Russian harvest which brought the prices for the competing harvests more in line. Because of this many vendors who had been selling Russian Red King Crab have been forced to raise their prices. As always, Captain Jack's guarantees the crab we sell is genuine Alaska USA harvest.